The Ya pear is also known as the Chinese White Pear and is native to northern China where it is widely grown. These are juicy white pears, which taste like a cross between a rose and a pineapple. They are crisp and sweet and delicious. Pear trees can grow to 60 feet and may be as old as 300 years. Pear wood, being a hard wood, can be used to make furniture. Among the many Asian pears, Ya pears are cousins to the pears that are typically seen in grocery stores, but this fruit is similar to an apple and its many names reflect that characteristic. Other names that this fruit goes by are: Chinese pear, Japanese pear, Sand, Nashi, and apple pear. Asian pears differ from the traditional European ones in that these pears are usually round, firm to touch when ripe, and are ready to eat after harvest. 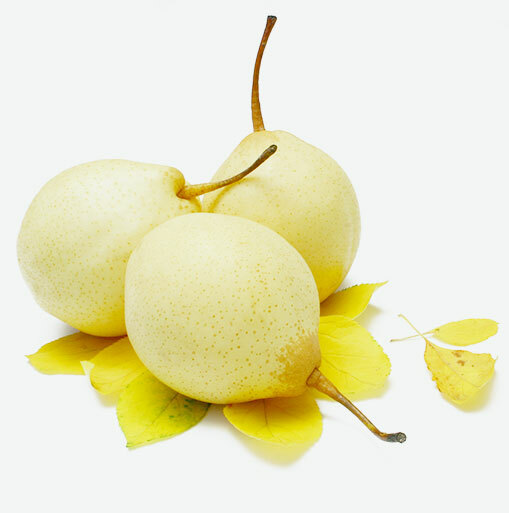 Asian pears reach prime quality when they ripen on the tree, like an apple and peach. These pears will be crisp, juicy, and slightly sweet with some tartness, especially near the core. Although not well documented in scientific research, pears are often recommended by healthcare practitioners as a hypoallergenic fruit that is less likely to produce an adverse response than other fruits. Particularly in the introduction of first fruits to infants, pears are often recommended as a safe way to start. Pears are a good source of vitamin C and copper. Both of these nutrients are antioxidants which help protect cells in the body from oxygen-related damage due to free radicals. Select the most fragrant fruit that is free of bruising and with little to no brown spots. Ripe Asian pears are hard and do not soften. They are ready to eat when purchased. Ya pears are known for keeping well. Store pears for about 4 days at room temperature or up to two weeks in the refrigerator. Ya pears can be enjoyed just eating fresh out of hand. Gently wash the skin under cool water and pat dry. They can be used in salads, slaws, soups, and sandwiches. Enjoy Ya pears as you would with other pears and apples in cobblers and fruit crisps. To prevent discolouration when cut, dip in a mixture of water and lemon juice. Since their skin provides some of their fiber, it is best to not peel the fruit but eat the entire pear. To cut the pear into pieces, you can use an apple corer, cutting from the fruit’s base to remove the core, and then cutting it into the desired sizes and shapes. Once cut, pears will oxidize quickly and turn a brownish color. You can help to prevent this by applying some lemon, lime or orange juice to the flesh.